The Estate Swing Cell Phone Access Receiver is the ultimate in versatility and convenience for remote opening of any gate opener. This receiver totally eliminates the necessity of purchasing or carrying extra remotes because it provides access to the gate opener through an item most people already carry - a cell phone. Simply dial the receiver number and, through caller ID, the receiver will recognize the programmed number(s) and open the gate. This is more secure than traditional remotes because the number has to be programmed into the receiver to operate it, so there is less of a chance that unauthorized persons will be able to operate the gate. It's convenient for small apartment complex managers and their residents, since the residents' numbers can be programmed into the receiver so the manager doesn't need to purchase and hand out extra remotes. Similarly, because so many numbers can be programmed into the receiver, each member of the family, plus friends, extended family, and others, can operate the receiver easily and conveniently. Finally, the range of this receiver is truly unlimited, so long as there is a cell tower available to receive and transmit the call. This is particularly beneficial in areas that have a great deal of interference for traditional radio transmitters and receivers, or for users who wish to open the gate from extended distances (such as from a home, garage, or lengthy driveway). The Estate Swing Cell Phone Access Receiver allows the user to avoid all that while providing a simple, secure, and convenient means of operating the gate opener. Unlimited Range - So long as there is an operational cell tower and there is no interference with the signal, the range is unlimited for this receiver. It is possible to call the receiver from across the country and it will operate the gate. Programmable Caller ID - The receiver permits access through caller ID; up to 64 different numbers can be programmed into the receiver's caller ID. Users simply call the receiver's number (determined by the SIM card; not included) and it opens upon recognition of the number. Because the receiver does not pick up the call, no minutes are used. One method is that users purchase a go-phone or track phone with a SIM card so the SIM card has a number attached to it; users may also add an extra line to their current cell phone service and use a SIM card for the extra line. 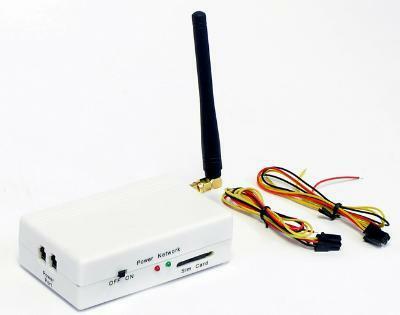 Easy to Install - This receiver runs right off the control box power source, so installation is simple.